Gold yellow shining metal is most popular investment option of Indian. Majority of Indians purchase gold in Diwali. 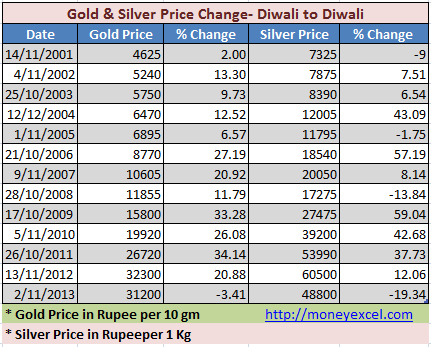 In last 10 year first time gold has given negative return this diwali. Gold has lost its glitter this diwali. In Samvat 2069 gold has given negative return of 4% and silver has given negative return of 20%. In last year diwali gold price was 32,300 Rs/- per 10 gm and silver price was 66,500 Rs./- per kg. This year diwali gold price is 31,200 Rs/- per 10 gm and silver price is 48,800 Rs/- per kg. This year gold price has reduced by 1,100 Rs/- and silver price has reduced by 11,700 Rs/-. 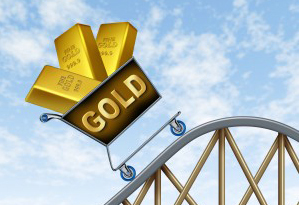 Gold is consistent performer and mostly give positive returns. Gold price is growing exponentially. This year gold and silver both has given negative returns. Silver price history shows that silver is volatile in nature & difficult to predict. What do you say gold and silver will give good return in 2014?